Art Center College of Design + Jovenes Inc.
Caminemos Juntos is collaborative storytelling project between design students and youths from a transitional homeless shelter in Boyle Heights, CA. During a 10 week period, we designed collaborative sessions in which writing, poetry, photography, verbal expression, and teamwork were explored through designed ethnographic exercises. As a response to the misconceptions of homelessness, a song was co-written by three members of Jovenes Inc.: Kevin, Marlon, and Lorenzo. 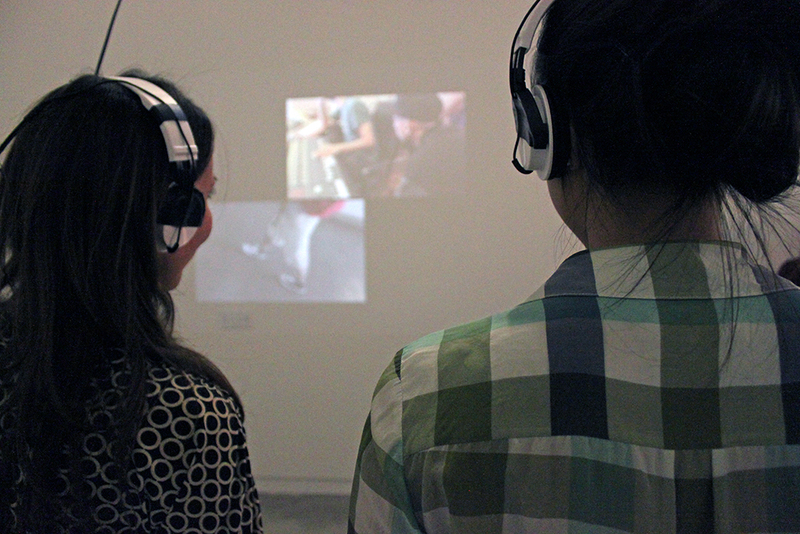 The song and interactive installation debuted in an multimedia installation in Pasadena, CA. Floor sensors shaped from the youth's shoes were controlled by an Arduino that would trigger videos controlled by a Processing sketch. The audience would step onto the acrylic cut-outs, and videos showing the collaborative making process of each individual would trigger to play. The cut-outs invited the audience to literally and figuratively step into the shoes of the three youth and listen to their stories in the song. 'The Road I Walk' was performed spontaneously at the Caminemos Juntos show, and the youth continue to perform the song in other venues and communities. Thank You: Eric Hubbard, Blanca Torres, Danny Nogueiras, David Jerkovich, D'Angelo Lacy, Jovenes Inc., and Passion HiFi.